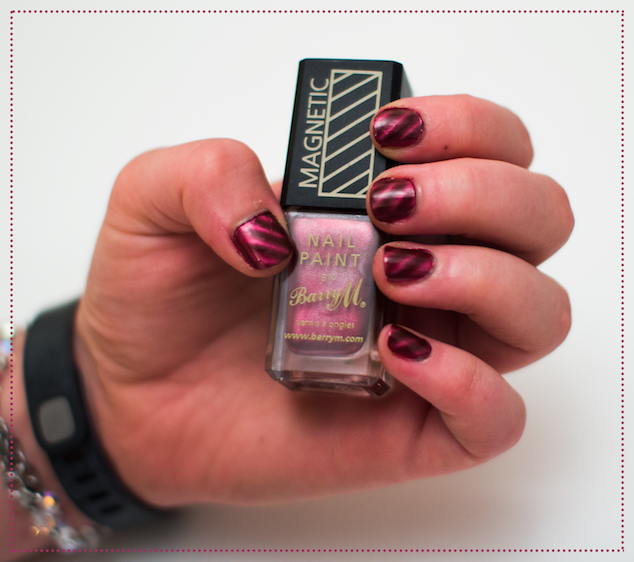 Here today is my Barry M Magnetic Burgundy nail polish Product Review. This nail polish I have found to be absolutely fantastic. It is strong and long-lasting and it doesn’t chip. It took a few attempts to understand how the product works but the end result looks amazing. There are a variety of different metallic colours and a range of different magnets to create different effects which I can’t wait to try out! Step 1. Before you start shake well. Step 2. Apply one coat and let dry. Step 3 Apply second coat and immediately hover the magnet over the nail for 5 seconds so effects appears. I found holding the magnet longer than suggested gave me a more prominent colour change and I then finished with a clear top coat.